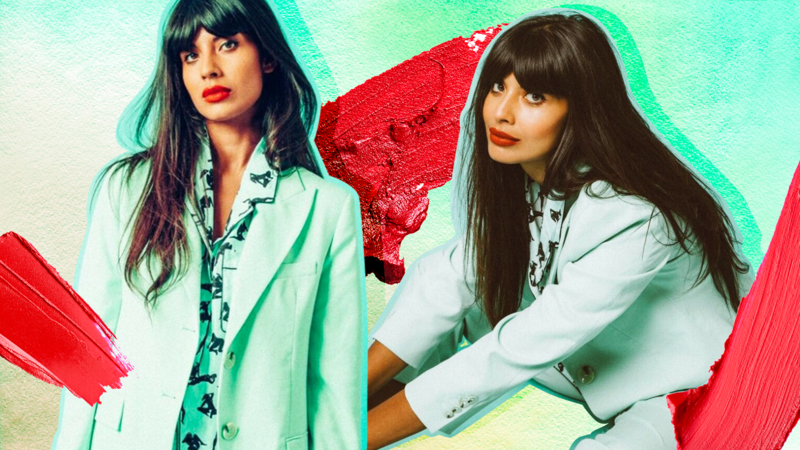 Jameela Jamil is not afraid of taking on body-shamers. At the age of 26, the actor — now best known for her role on NBC's The Good Place, but at the time, a BBC Radio 1 DJ — addressed the House of Commons of the United Kingdom about "the disgusting way we value women," she tells SheKnows. On top of that, she has released three plus-size clothing lines to ensure women of all sizes and shapes have a space in high fashion and has been publicly campaigning for body positivity for nearly a decade. So when she saw an Instagram post earlier this year featuring the female members of the Kardashian-Jenner family each labeled with their body weight, Jamil (now 32) was not a fan. In response, she posted a photo to her own Instagram page listing all the ways she valued her life, including her relationship, friends, job and financial independence, among others. Without any prompting from her, by the end of the day that she posted her "I Weigh" photo, more than 1,000 other women had done the same thing on their own social media feeds. At that point, Jamil knew it was more than a singular Instagram post: It was a movement that needed a home. In March 2018, she created the I Weigh Instagram account, which shares several posts from people around the world every day. "I only started the Instagram account because there were so many amazing posts and I didn’t want them to disappear," Jamil explains. "I wanted them to live somewhere and it turned into an online museum of self-love." More:Why Are We So Fascinated by Celebrity Body-Shaming? Interest in the I Weigh movement shows no signs of slowing down, either. Jamil says that she receives 50 to 100 posts each day from women and men around the world "from every age, every background, every size and shape and height." Although she says she didn't start out with the intention of creating a movement, the timing was right. "I think it coincides with a moment where women are starting to take a look at what’s going on around us and realize that we’re being treated very unfairly, even in this day and age," Jamil notes. Not only was it the right time for this particular brand of body positivity, but the fact that it was Jamil's genuine response to women being valued by our body weight that really resonated with people. "It was very organic. It was very from-the-heart," she explains. "I was just very, very upset and I felt like my gender was belittled yet again. And I think that a lot of people feel that way, so it just resonated with them. And the fact that it felt real and didn’t feel contrived or like a publicity stunt must have spoken to people. Then everyone just sort of joined me." Even though we all have these authentic not-going-to-take-it-anymore realizations, Jamil knew she was in a position to use her social media following for good. "I think we all have those moments, and I think it’s just very rare that someone with a platform just says it, because we’re all so brainwashed into conforming to it that we’re too scared to fight back," she says. "But this industry doesn’t mean enough to me to be a bad role model. Nothing means enough to me to abuse my position and not speak up for those being damaged." Jamil hasn't always felt this way about her body. She says that she had severe anorexia between the ages of 14 and 17 thanks to the images of women's bodies she saw in magazines and on television. "It was just constant subliminal messaging and shaming when it came to having any fat on your body whatsoever and not just succumbing to the pornographic patriarchal gaze," she says. "I said, 'I’m not going to go to the gym. I’m not going to go on a diet. I’m just going to see what happens, and maybe this is my body now, and I’m going to embrace it,'" she explains. Jamil says that she knew that if she lost a lot of weight really quickly, it would send the message that there's something wrong with being curvaceous and that it's something to be ashamed of. Instead, she "held onto it" — the weight, that is — as long as she could. It came off itself, slowly and naturally, over five or six years without her doing anything other than making sure she was eating healthily. And when it comes to the I Weigh movement, Jamil is quick to point out that she feels as though she has been healed by the people who have participated and has never felt so strong and comfortable in her own skin. "I didn’t make the movement: Women made the movement," she clarifies. "I sort of lit the fuse, basically, and then the movement was taken over by everyone else. This is not my movement — it’s our movement, collectively. It is a collective of people who’ve just had enough. They’ve all woken up and realized that they did not have a strong perspective on their self-worth, ever." Jamil — who is currently working on a book she describes as "a revolution against shame" — asks others to post their own I Weigh images and to encourage their favorite celebrities and role models to do the same: "Let’s take this as far as we can together so that we can finally have enough power and influence to change everything at the top."